Homer’s “The Odyssey” was the inspiration behind the Coen brothers’ “Oh Brother, Where Art Thou.” And that ancient epic provides the loose structure and coded, contemplative essence of their latest, “Inside Llewyn Davis,” a brooding folk-music-on-the-brink-of Dylan period piece built around a heroic quest. Not that “heroic” leaps to mind when watching Llewyn, beautifully underplayed by Oscar Isaac. He may sleep on a succession of friends’ and acquaintances’ sofas and not be able to afford even a winter coat. But at least this folk music failure is doing more than merely “existing,” which is what the “squares” of 1961 did. Llewyn is a soulful, melancholy member of that ever-so-brief folk “craze” that peaked with Bob Dylan, Joan Baez and Peter Paul and Mary making their marks in the late ’50s and early ’60s. Llewyn has a new “High Fidelity” LP to his name and no one is buying it. He plays a Greenwich Village “basket joint,” where if he’s lucky, his rapt, turtlenecked audience will drop enough in the passed basket to allow him to eat, smoke and hang on another day. And from the minute he leaves the stage and is subjected to a back-alley beat-down, we know Llewyn is his own worst enemy, a chilly embittered jerk who keeps making wrong-headed decisions and keeps wondering why things don’t work out for him. He was half of an up and coming folk duo, but the partner is gone. He’s mooching off friends, slept with Jean (Carey Mulligan), even though he’s pals with Jim (Justin Timberlake). And Jim and Jean are a folk duo, on and off stage. Llewyn is rude to his sister (Jeanine Serralles), has an abortionist on standby in case of “accidents,” and is little value to his small-time record label. And he keeps seeing earnest, WASPy, clear-voiced newcomers get the breaks he’s never had. But he’s trying to do better. The cat of some friends gets out as he’s leaving their apartment, and he totes it all over New York, waiting for the chance to give it back. He wants to make peace with a furious, foul-mouthed Jean (Mulligan has never show us this). Because whatever he wants to call it, this unhappy life is just existing and it is not working out. The Coens, perhaps inspired by the life story of their fellow Minnesotan Bob Dylan, impeccably re-create that era, from the seedy venues to the perpetual winter of the best folk music record covers. Davis (“10 Years”) performs several folk classics in their entirety, another layer of “authentic” in a movie all-too concerned with that. But “Inside Llewyn Davis” goes nowhere, even when Llewyn joins a dope-addled jazz player (John Goodman) and his “valet” (Garrett Hedlund) on a cross-country drive straight out of “On the Road” — which starred Garrett Hedlund. 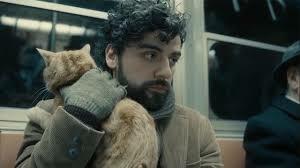 It’s like the too-perfectly groomed “down and out” Llewyn is living through a Coens’ version of purgatory. The movie is so “interior,” it so zeroes in on Isaac and his baleful stare, that we’re relieved any time something overtly funny happens — a studio session with Jim (Timberlake) cutting a parody ditty about John Glenn, or a Goodmanesque rant about “real music” (jazz, where “we play twelve notes, ALL the notes on the scale”) vs. folk. A few fine performances (F. Murray Abraham plays a folk impresario) burnish a lot of seemingly random scenes, many of which place choices in front of Llewyn, who is sure to make the wrong one. And with all the brooding that goes on “Inside Llewyn Davis,” the movie, which never has much momentum, stops cold with every bit of perfectly-recreated music on a stage. Credits: Written and by Joel Coen and Ethan Coen. A CBS Films release. Without the cats, very little happens in the movie. The feeble attempt at a subplot, re abortions, goes nowhere. Virtually every little bit that happens can be predicted in advance, e.g., when he opens the window, we know the cat is going outside. Pathetic. Great review, glad I’m not the only one who wasn’t too impressed – despite being a Coen Brothers fan. Big fan. 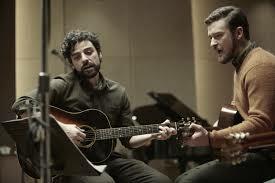 Love folk music, interviewed and did profile of Oscar Isaac. And this didn’t do much for me. “A Serious Man,” their “True Grit,” that Clooney/Pitt spy comedy, the Billy Bob period piece. They do not hit it out of the park every time, and eventually, people will come to realize that about Scorsese and David O. Russell as well.